Located five kilometers northwest of the downtown of Guilin, the Reed Flute Cave Scenic Area is one of brilliant and marvelous caves in Guilin and a must for home and abroad visitors. It takes an hour to finish the tour in the cave for it is 250 meters in depth and 500 meters in length. The cave got its name from the verdant reeds growing outside, with which people make into flutes. Inside this water-eroded cave is a spectacular world of various stalactites, stone pillars and rock formations created by carbonate deposition and so formed a lot of stalagmites, stone-screens, stone-flowers and stone-pillars of various shapes. Illuminated by colored lighting, the fantastic spectacle is found in many variations. It is marvelous that if you make a strike on some of the stone-screens, there will be a fantastic melody that we never hear anywhere. 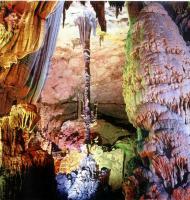 The Reed Flute Cave is divided into four scenic sections according to their special features - the first scenic section is full of wizard, yet fascinating; the second is splendid and magnificent with variations; the third shows its large space with mystery and the forth owns various graceful and delicate attractions with winding path. The Flute Cave includes many appealing attractions, such as 'Morning Glow over Lion Forest', 'Half a Poem Terrace', 'Stone Tortoise with Billowy Waves', 'Pagoda-shaped Pine Defying the Snow', 'A scene of Rich Harvests', 'Penglai Wonderland', 'Scarlet Stone Wall' etc. The entire scene is worth of enjoying and meditating whether you're under the heaven where lives the God. Reed Flute CaveLike a splendid picture of a huge forest, 'the Morning Glow Over Lion Forest' is famous for a number of thousand-year-old trees with stems and branches canopied under luxuriant foliages in addition to the young sprigs with fresh and tender green leaves as well as groves of shrubs along mountain slopes between high-rising peaks. Every day at the moment when the sun rises the red-glow of the sun reddens all over the trees and sprigs, groups of lions, big and small will come out here to play. If you look at them carefully you'll find some of them crouching, some rolling and some skipping, therefore, making the whole forest seam to be full of vigor and vitality. Because there are groups of lions, trees and morning-glows in this forest hence the name 'Morning Glow over the Lion Forest'. It's hard in wording for describing the splendid wonder. In between the two billowy waves in front of us there is a small stone tortoise, which as said used to be a small tortoise in the sea. Millons of years ago Guilin was still a vast sea. Growing and living here in the Reed Flute Cave were a great number of sea plants and animals. Fish, shrimps and tortoises often came here to find food and play around. But later her upheaval of the earth-crust rendered Guilin into a piece of land and all those fish and shrimps went away with the seawater to the east sea with the exception of this small tortoise. Enchanted by the beautiful scenic attractions in the cave this small tortoise stayed on and made its home in between the two billowy waves, hence comes the name 'Stone Tortoise with Billowy Waves'. Towering in front of us is a tall stone pillar, which looks very much like a snow-pine in the shape of a pagoda. How tall and straight it is! As a popular saying goes a pine does not look smart without being clad by snow. This pine-snow clad in thick snow and defying the severe cold, expresses a noble quality, a lofty aspiration of 'heavy snow depresses the green pine yet it stands even more upright and straight'. Besides, we can also see a pudgy snowman here that is seemingly gazing at the snow-pine in a curious way, or respectfully welcoming guests. Hence this scene is called the 'Pagoda Pine Defying the Snow'. You can see two overcoats hanging on the Pagoda Pine as well, but you can't find any host here cause they have gone to hunting in the mushroom hills. We call it as 'A scene of Rich Harvests' for it presents a scene of rich harvests in sight. It is a plot of melons, fruit and vegetables, and over there are still some cauliflowers, big turnips, peanuts as well as legumes and towel gourds, etc. besides, we can still see a big watermelon over there. Penglai Wonderland is a small pretty island. Growing on this island are many rare and strange flowers and trees, among which some are eternal evergreen trees, others are never-withering cockscombs and still others are precious herbs of Chinese traditional medicine, such as: ginseng, Chinese angelica and so on. You see, the roaster has just crowed with the east dawning, people are already out on the move now. They, treading on backs and herbs in mouths, are busy with plucking medicinal herbs; others are sitting round the ground as though they were discussing about something. Visitors, on seeing this scene, all say they are the members of millions of framers they've come here to pick medicinal herbs and help cure the diseases of their country folks, therefore realizing a universal spring on the Penglai Wonderland. On the piece of stony wall, you can see five colors of scarlet, yellow, white, gray and black, in which scarlet is the most eye-catching one. Hence it is called the 'Scarlet Stony Wall'. Actually the colors are formed by water containing a mixture of calcium carbonate, magnesium carbonate and ferrate and soil, which kept on flowing over the surface of the stony wall through a long process of sedimentation, condensation and weathering. 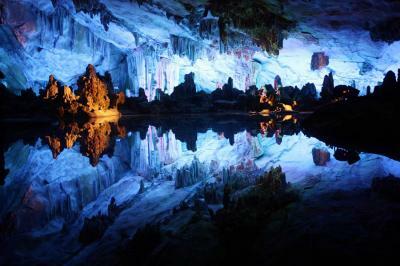 Standing on a raised platform is the best place to enjoy charming scenes in the 'Reed Flute Cave'. Look ahead, under the serene blue sky there rising up from the ground is a forest of strange peaks with a stretch of water girdling the hilly city. If you look still father you'll find myriad of peaks vying one another with their beautiful charms, and hills and waters intermingling one with the other. Isn't it a picturesque scroll painting of the Guilin's landscape? Yes, it is. It's really as beautiful as Guilin. It has four distinctive features that the landscape in Guilin has, such as pretty peaks, crystal clear waters, strange caves and grotesque stalactites and stalagmites. Looking back you'll find a splendid view of a vast virgin forest with densely growing tall trees. Here stands a green pine of thousand years old. 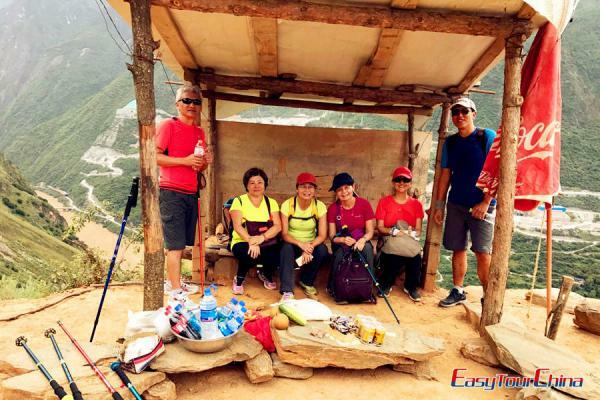 In a word, on this cloudy terrace you can have a panoramic view of all picturesque scenes around Guilin, hence the derivation of the name 'Enjoy Charming Scene on Cloudy Terrace'. 'Jade Cameo' is engraved with motifs of flowers and grasses, fowls and animals, hills and waters and rosy clouds, and in addition, there are some buildings on it too. This is why the name of 'Jade Cameo' comes about. But if you look at it carefully and bring you imagination into full play to see how many kinds of carvings you can tell. Here is a lithophone and it is called the 'Ding-dong Lyre'. You can find keys on it with 1, 2, 3, 4, 5, 6, 7, 1 eight scales. If you strike it lightly with a small wooden strip it will produce Ding-dong sounds pleasing to your ears. It is said that Chang'e, the Moon Fairy always dances gracefully in the Moon Palace to the accompaniment of this 'Ding-dong Lyre'. Here you can see three square-shaped windows. What makes them different from the other is the fact that their curtains are hanged outside the windows. If you look through the windows with half-risen curtains you'll see undulating hills covered with green trees, scudding clouds and flowing waters that extend far into a great distance. 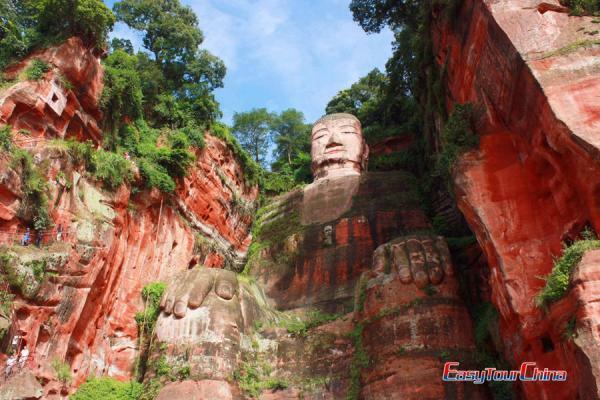 It's a spectacular landscape that has greatly roused the interests of every visitor to Buddha's hand and a downwards-hung lotus-flower and two round mosquito nets as well. It can be said for sure that somebody inhabits the cave dwelling. However, the owner is not in for visitors. Where has he gone? On the opposite hill, an old man has his grandson in his arms! They are there enjoying the splendid scenes around, and the grandfather is telling his grandson an interesting and fascinating tale. There is an expanse of blue sea and a pod of seals is swimming and rolling on the sea surface. Hung above is a iridescent colored lantern with its shafts of light brightening all round the hall. On the left you'll see some coral trees and tortoise-shell screen. The hall can be depicted on the whole like this: Jaspers of scarlet screen give forth whiffs of purple mist and thickets of stone flowers dot among scudding clouds. It is said that this is very Palace for the Dragon King in the East Sea - the Crystal Palace. The dragon palace refers to the place in Chinese novel 'Journey to the West', where Sun Wukong, the Monkey King made a havoc. It is a place spacious enough for the Monkey King to display his feats. Here is a medusa, a pagoda for taming the sea, and there is a big sea-snail, a small sea-snail, a big carp, and the magic needle for stabilizing the sea, which is used by the Monkey King as his magic weapon. Legend has it that to find a suitable weapon for his use the Monkey King pulled off the magic needle for stabilizing the sea, which set the whole dragon palace rock and sway. When the Jade Emperor in heaven learned the news he, greatly enraged, wanted to subdue the Monkey King by force. However, the Monkey King was not that sort of a person who could be subjugated. In a bid battle the Monkey King defeated all his heavenly opponents and now he comes here to settle account with the Dragon King in the Dragon Palace. Drifting on the sea surface the medusa was sent by the Dragon King to be on patrol duty. Inside the pagoda for taming the sea was laid the remains of the Dragon King's ancestors. When the Monkey King broke into the Dragon Palace he hit the pagoda wantonly with his magic rod, and so half of it was knocked off. Just imagine how many tons the big sea-snail weighs? By the order of Dragon King it was sent here on guard of the grand hall but was hit by the Monkey King and half of its shell was crushed. Very much on the alert, the small sea-snail, sensing the serious situation, was tooting to signal the alarm. The Monkey King, sitting on the bed of the Dragon King and sensing what the small sea-snail was doing, was enraged and made a bid hole on it by just hitting at it. What a big cap! It measured several dozen meters long. As it saw the Monkey King had smashed the pagoda for taming the sea it was greatly scared. So it dived deep into the sea with half of its body still out of the water with its tail in the air. With all its subordinates defeated the Dragon King had to confront the Monkey King himself but he was by no means a match for him. Severely wounded he had no way out but to hide himself in the dragon pond. Unfolding before our eyes is a magnificent picture of the Chinese Red Army Scaling the Snow Clad Mountain during the Long March. The troops of the Red Army, against the howling north wind with red flags held aloft, are scaling the snow-capped mountain and marching dauntlessly forward. This 'Inverted Reflection of Snow Clad Mountain' is a true deception of the strong willpower and great mettles of the Chinese Red Army. Here are eight small stalagmites, which look very much like eight immortals in long-sleeved gowns. Legend has it that, they, coming together to the Reed Flute Cave, were carried away by the beautiful scenes in Guilin, and decided not to return to the dull and quiet Paradise above. So they were turned into stones to stay on. A poem in praise of them by a latecomer goes like this: 'Would rather be mortal beings in Guilin than immortals in heaven'. Hence this scene is called the 'Immortal Stones'. Leaving the Crystal palace, turn around and look ahead, you'll see a pool of colorful lights in the distance. There you can see hills, waters and also some buildings high and low laid out in an orderly way. 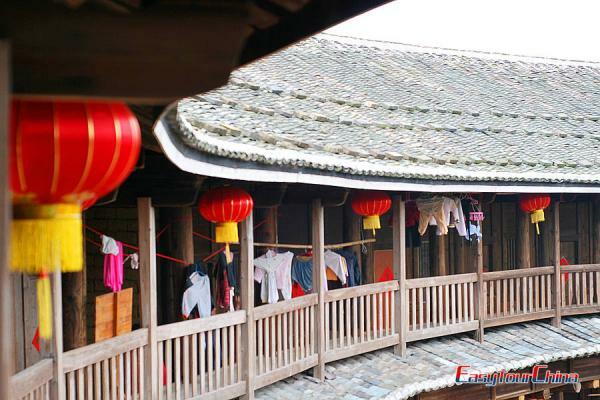 Visitors compare this scene to the hilly city of Guilin with picturesque scenery. Clearly visible on the surface of the water is a charming picture - Group of peaks float inverted in the water, hills setting off by waters make the scene even charmer. Hence the scene is called the 'gazing at Hilly City in Distance'. These precipitous peaks joining together form a spectacular cave. It is deeply settled in the mountain valley. On top of it grows a large golden sunflower, which, with its fully-grown seeds, seems to have been ripe now and looks very lovable. Therefore, visitors here call it the 'Slim Cave with Sunflower'. People say: 'In the Reed Flute Cave, ginger can grow on the rock'. However, this clump of gingers grows in an inverted way and it can only serve to feast your eyes on but by no means edible. This stone whip looks very heavy and nobody here can lift it up. But legend has it that in the past there once came a tour a Hercules, who, seeing the stone ship blocking the way of visitors, tried very hard to pull it down so as to facilitate tours here. But to his great regret, no matter how hard he bit of it with only five fingerprints left on the stone. This is a tiny and quiet cave, which is formed of stone-curtains, stone-flowers and group of stone-pillars. Legend has it that in the past there used to have a young fork-song singer, who often cane here chopping firewood. As the hill was overgrown with reeds he cut them down and carried home. Using the stems of reed he turned them into delicate pipes. While having a rest he got his reed pipe resounded and singing. Over there two persons on the hill and an old man at the foothill are all carried away by the beautiful melodies of the flute, and even the gecko is out from the cave to listen to it, hence the scene is called 'Listening to Flute-playing in Secluded Recess'. You see suspended above is a magic mirror, which is covered up with a thin veil. If you unveil it the mirror will give forth a shaft of bright rays and all imps and hobgoblins are afraid of it. For the moment the thin veil is still on yet this centipede is already scared out of wits and is fled into a cave for hiding, hence the scene is called 'Magic Mirror Mirroring the Centipede'. Here is a stone drum. It is very thin. If you strike it lightly with your hand, it will produce a rumbling sound as if it were the thunderbolt in spring. The resounding sound, touching the heartstrings of men, encourages them to make more efforts and work hard. Inspired, visitors here usually say: there are so many scenic attractions in the Reed Flute Cave but flowers begin to blossom only when the drum starts to rumble. Hence the scene is called 'Rumbling Drum Heralds Spring'. It looks like a stage. On this stage performance are on quiet often. However, today you did not come at a right moment for the show is just over. The curtain on the stage is slowly dropping, so you are welcome to come here next time for the show. You see the water is cascading down from the mountain peak, and irrigated by the water the fertile farmland around is in rich green now. An old saying goes like this: Water comes down continuously from the happiness mountain, and tender spring never goes aging with water constantly flowing. Therefore, the scene is called 'Water Cascading Down From a High Mountain'. Here is a grove of flowers, which, looking very much like the billowy waves on high seas, are rushing towards this side. Under the water there is an unfathomable snow valley in which you'll see a silvery icy peak with a water-pillar standing inversely, thereby forming a spectacular view of landscape. There's a big goldfish at the top of the stone pillar, which with its head downwards and tail upwards is ready to plunge into the water now. We are now nearly at the end of the visit to the Reed Flute Cave. However, the giant lion is very hospitable. Seeing the guests are about to leave he's eager to come out to see you off. He opens wide his mouth as if to say: "Friends, goodbye! You are welcome to come here again for a visit next time! ".